This entry was posted on October 5, 2016. Bookmark the permalink. 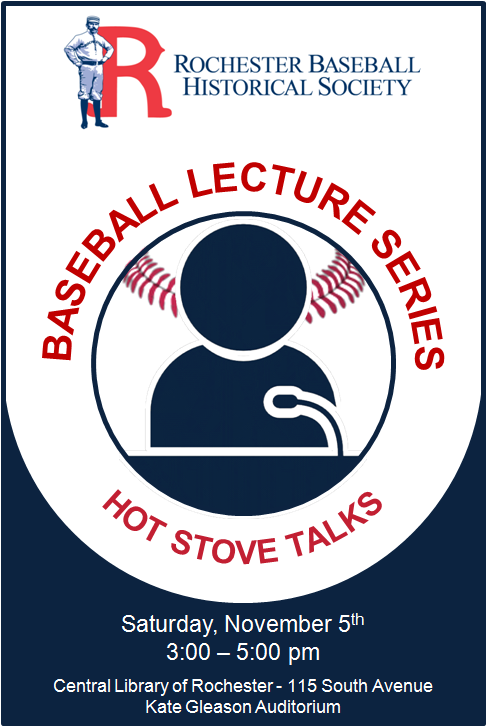 Join RBHS for an afternoon of baseball talks as we start the Hot Stove season. On July 25, 1959 Red Wing Player Frank Verdi was struck by a stray bullet while coaching third base for the Wings during a game in Havana, Cuba. This presentation will explore the events of that night, the US and Cuban response to these events, as well as some additional Cuban adventures of the Rochester Red Wings. On April 18, 1981 the Rochester Red Wings and Pawtucket Red Sox began a game that would become the longest ever in professional baseball history at thirty-three innings. Award winning author Scott Pitoniak will discuss this game and its legacy. With the rise of Statcast and other technologies, the amount of data being generated at baseball games is rising exponentially. SABR’s Data Manager Sean Lahman will explore this data explosion and how it is changing the game on and off the field. The official photographer of the Rochester Red Wings, RBHS President Joe Territo will present on baseball photography including exploring some iconic baseball images, the evolution of both baseball and photography, and sharing anecdotes from his own award winning work.